It has been rumored for a while that Android apps and the Google Play Store would be making their way to Chromebooks, but now we officially have proof that the marriage is on the way as evidenced by a Google I/O session description. There's not a lot of information just yet, but the session is scheduled for tomorrow, so we should know more then. It doesn't sound like the Play Store will be hitting Chrome OS any time too soon, because the session is described as a time for developers to learn more about optimizing their Android apps for use on Chrome. 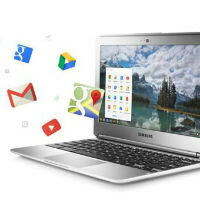 Google says there will be friendly engineers there to help optimize Android apps for Chromebooks, and the first 50 developers to show up will be receiving a free Chromebook. Google I/O is all about the freebies. If we had to take a guess, we'd assume Android apps and the Play Store will be coming to Chrome by fall at the latest, because most everything that Google has been announcing at Google I/O so far has been scheduled to be released this summer or fall. Once Android apps do make it to Chrome, it would be a big boost for Chromebooks in allowing the devices to rely less on the Web and a constant Internet connection. Been waiting for long time now. Native Skype app! This is awesome! Good job, Google. Maybe now Chromebooks will finally be semi-useful. Well crap! Most Chromebooks are only 16GB. Now they need to make it so you can extend the storage capacity for apps using the SD card, though I doubt that'll happen. I'm still excited for this feature though! Dude! That was one of the things I wanted to do with my Chromebook, but the SSD is permanently attached to the internal components of the computer so there's no way to swap. It pissed me off to no end when I discovered that. It's most definitely something that I will research before I buy a new Chromebook. That being said, I think that I'll be holding onto mine for quite some time. It still runs silky smooth, More than what I can say for my Wife's Windows 8 client that's half the age of mine.